In our fortnightly series of art market rankings designed to highlight some of its key trends, this week, artprice take a look at the new generation of artists emerging on the secondary market. One conclusion stands out above the rest: you don‘t have to be over forty to fetch over a million dollars! Her record currently stands at over $3 million for a painting of her sister (The Beautiful Ones) sold in 2017 at Christie’s in London by Peggy Cooper Cafritz, an equal rights activist and a major collector of African-American and African art who died last year. 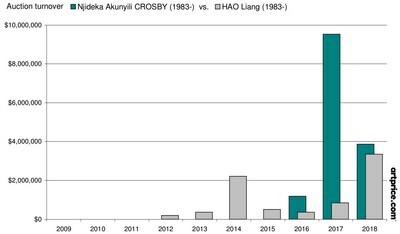 Initially American, demand for Crosby’s work quickly spread to Asia (with the successful sale of Tea Time In New Haven, Enugu for over $900,000 at Christie’s in Hong Kong on 27 May 2017). The Chinese art market produced the second ‘millionaire’ young artist of 2018 in the person of Hao Liang who first caught people’s attention in 2014 with a superb auction debut: a silk scroll over 13 meters long titled The Tale of the Clouds that fetched $912,000 at Christie’s in Shanghai. Chinese collectors always support their artists, even when those artists don’t yet have an international reputation. For proof… our Top 10 ranking also contains an artist about whom almost nothing is known except that he is called Jia Chang, was born in 1981, and that one of his drawings elicited vigorous bidding at the Four Seasons Hotel in Beijing at a sale organized by Poly Auction. The drawing entitled Elephant (355 x 190 cm) multiplied its pre-sale estimate by five with a final bid of $679,000 on 17 June 2018. A spectacular result that could be a straw fire… or may translate into solid medium-term support. Courted by museums and the media, the young artist is seeing her auction prices rocket after a first discreet appearance at Sotheby’s in London in October 2017 and despite two unsold pieces in New York last year. Singer produces surprising large fictional compositions, mainly in black and white, integrating 3D modeling. Considering the support she is receiving, we can expect further surprises. In 2013, her canvas Fellow Travelers, Flaming Creatures was acquired from New York’s Greene Naftali Gallery for $20,000. In May 2018 the same work fetched $735,000 at Sotheby’s New York. « Artron Art Group (Artron), a comprehensive cultural industrial group founded in 1993 by Wan jie, is committed to inheriting, enhancing and spreading art value. Based on abundant art data, Artron provides art industry and art fans with professional service and experience of quality products by integrated application of IT, advanced digital science and innovative crafts and materials.